1000 1000 0% off in Rs. Colour and flavour variation in foods throughout the seasons and the effects of processing and storage often make colour addition commercially advantageous to maintain the colour expected or preferred by the consumer. People associate certain colours with certain flavours, and the colour of food can influence the perceived flavour in anything from candy to wine. For this reason, food manufacturers add these dyes to their products. Sometimes the aim is to simulate a colour that is perceived by the consumer as natural. Food colouring is a substance, liquid or powder, which is added to food or drink to change its colour. Food colouring is used both in commercial food production and in domestic cooking. Due to its safety and general availability, food colouring is also used in a variety of non food applications. Flavourings are focused on altering or enhancing the flavours of natural food product such as meats and vegetables, or creating flavour for food products that do not have the desired flavours such as candies and other snacks. Most types of flavourings are focused on scent and taste. Few commercial products exist to stimulate the trigeminal senses, since these are sharp, astringent, and typically unpleasant flavours. Flavourant is defined as a substance that gives another substance flavour, altering the characteristics of the solute, causing it to become sweet, sour, tangy, etc. Flavours and flavour enhancers will remain the largest segment; while alternative sweeteners grow the fastest. Food additives are substances added to food to preserve flavour or enhance its taste and appearance. Food additives are used during production, processing, treatment, packaging, transportation or storage of food. The present day food industry has grown and flourished due to the liberal use of food additives. These additives have also led to the extensive production and marketing of easy to prepare convenience foods. The natural food colour industry market is growing at 10% to 15% annually. The global flavour industry can be characterized as highly technical, specialized, and innovative. This industry is highly competitive and concentrated, compared to other product categories within the food and beverage market. The global flavours market is predicted to grow at a Compound Annual Growth Rate (CAGR) of 2% per annum. In this twenty first century, mankind has developed a technology to retain the original value of food by adding additives, flavours and colours, which also increase the taste of food. This book basically deals with food colorimetry, synthetic colours used food, manufacture of synthetic organic colours for food, analysis of synthetic food colours, synthetic dyes, aluminium lakes, inorganic pigments, the influence of colour on sensory, perception and food choices etc. This particular publication will guide to our food technologists, agriculturists and management of planning commission to tackle their problem efficiently. This book is very useful for new entrepreneurs, professionals, research institutions, libraries, for those who want to diversify in the field of food colours, flavours and additives technology. All about Food Color Additives, artificial food colors natural food colors, artificial food dyes, Colours and food additives, common food additives, ffects of food additives, Flavorings, Food Flavours, Natural Food Flavors, Food Additives & Ingredients, Food Additives and Colors , food additives definition, Food Additives Industry, food additives list, Food Additives manufacturing, food additives pdf, Food color manufacturing, food coloring ingredients, Food colours Industry, Food Dyes, Food Flavors, Food Colours, Food Flavors technology book, Food Flavour Technology, Food Flavours Industry, Food Flavours manufacturing, how to start food additives manufacturing business , how to start food colors manufacturing business , how to start food flavors , manufacturing business , Natural Food Colors & Flavors , natural food dyes, Production of Food Additives, Production of Food colors, Production of Food flavours, Small Scale food additives Processing Industry, Small Scale food colors Processing Industry, Small Scale food flavors Processing Industry, types of food additives, What are the ingredients of food coloring?, What is food acid?, Why are additives used in food products? The primary objective intended for this chapter is that of providing a fairly practical guide to the use of synthetic carotenoids in the food industry. The scope is very considerable and the progress which has been made since the first commercial product appeared in 1954 is wide ranging. Not only have many applications been investigated but also other carotenoids have been added to the palette of the technologist. There is no doubt that further progress will be made in both directions and the pace may be expected to increase as the artificial dyes have their applicability reduced. The principal groups of colours naturally occurring in foods are carotenoids, anthocyanins, porphyrins and chlorophylls. The carotenoids, being found throughout the vegetable kingdom are especially widespread and important. Because other colours which may occur, particularly chlorophyll, can mask the carotenoids, their presence is not always obvious. Nevertheless, these compounds are responsible for many of the brilliant red, orange and yellow colours of edible fruits and berries, vegetables and mushrooms, as well as flowers, insects, birds, fish and other animals. Some idea of the importance of carotenoids may be gained from the estimate (probably conservative), which puts nature's own production at around 100 million tonnes per annum. Among the components of this impressive quantity it is fucoxanthin, the characteristic pigment of many marine algae, which is most abundant. As may perhaps, be expected, it is the three main carotenoids of green leaves which are next in order of magnitude. These are latein, violoxanthin and neoxanthin. Others are produced in smaller quantities although, from the viewpoint of food technology, their importance is much higher. Some of the carotenoids, such as b-carotene and zeaxanthin, are very widely distributed and so become important as components of many foods. Others, for example lycopene and bixin, may achieve their importance and magnitude by being the main colours of a particular fruit or vegetable. Carotenoids are also found in combination with proteins as caroteno-proteins. These compounds are common to a wide variety of animals, notably the invertebrates. For example the blue carapace pigment of lobsters is crustacyanin. The same prosthetic group, astaxanthin, appears in the green carotenoprotein of the lobster egg, ovoverdin. Carotenoproteins are an important group of animal colours whose functions are not well understood. Nevertheless, they may well be more important, functionally, than the carotenoids in the animal body. Various natural extracts containing carotenoids have been used as food colours for centuries. Examples include the yellow colour of saffron (crocetin), the pinkish yellow of annatto (bixin or norbixin, depending on the application type), the orange-red of paprika (capsanthin and capsorubin), various colours obtained from extracts of leaves (xan-thophylls), orange yellow extracts of carrots (carotenes) and rich yellow, formerly used in margarine, of red palm oil (carotenes). 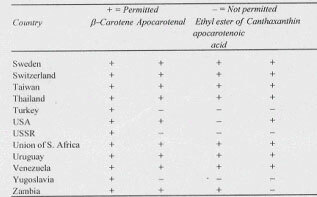 An indication of the widespread distribution of carotenoids in human food may be gained from Table 1. The figures given in the table are mostly for b-carotene, the rest are total b-carotenoids. Columns B and E give the contents in Âµg/100g. Roels originally composed the table in order to allow comparison of the pro-vitamin A values. To do this, he took the figures of Watt and Merrill which were published in terms of IU 100 g. In turn, these authors had used an equivalence of 0.6 Âµg b-carotene and 1.2 g other carotenoids to 1 IU of vitamin A. Roels used the same b-carotene activity relationship to convert the original b-carotene equivalents of Barrett and Widdowson. These derived vitamin activity levels are given in columns A and D. Reversing the calculation gives the weights of B-carotene equivalents, columns B and E. The remaining columns C and F show the equivalent vitamin A activity calculated using the usual ratio of 6 to 1 (See section on vitamin A activity). The figures given in the latest version of McCance and Widdowson's, The Composition of Foods (Paul and Southgate) are slightly different for some of the foods but, in the main, agree. Note: In the original table and later quoted by Klaui the values in the two columns headed A and D are attributed incorrectly. Information published which relates to carotenoid contents often, as may perhaps be expected, appears in terms of its dietary value. It is essential, when using such figures, to understand the basis of the calculation made by the authors. While Table 1 gives an idea of the widespread presence of carotenoids in our normal foods, there are also to be considered two other aspects: the complexity of the mixture of carotenoids in some foods and the variations which can occur, for example, during a season. The former is illustrated by Table 2, which lists the carotenoids identified in oranges. Bauernfeind in a paper on carotenoids in fruits, juices and concentrates reviewed the seasonal colour fluctuations and carotenoid changes during growth and maturation. Variations in the total carotenoids and b-carotene contents of citrus fruit juices based on published figures illustrate the differences to be found even in a small-related group of foods. While there are other speculative functions assigned to the carotenoids, those established include protective agents preventing damage to cells by photodynamic action and as accessory pigments involved in photosynthetic organisms. Although b-carotene is by no means the most abundant carotenoid in nature, it was the first to be synthesised commercially. Synthetic b-carotene was first marketed in 1954. Some eight years later b-apo-8'-carotenal (C30) followed and then, in 1964, canthaxanthin appeared. The pro-vitamin A activity of b-carotene makes it of special interest. 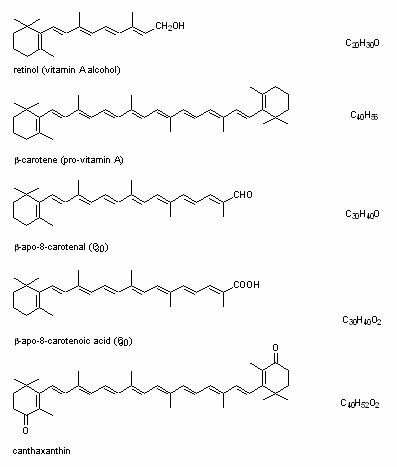 Apocarotenal (b-apo-8'-carotenal, C30) and apocarotenoic ester (ethyl b-apo-8'-carotenoate, C30) also have pro-vitamin A activity. Canthaxanthin, however, has no activity in this direction. The structural relationship which these carotenoids bear to one another and to vitamin A itself (retinol) is shown in Fig. 1. The question of the relative activities in terms of vitamin A is discussed later in this chapter. The synthesis of b-carotene presented a natural challenge to the ingenuity of the organic chemist, particularly because of its potential commercial importance. The first total syntheses were published in 1950 and were relatively quickly followed by the successful industrial synthesis by Isler and his team. As a result, the large-scale commercial production of pure crystalline b-carotene was made possible. Resulting from this success was not only the large international trade which has grown in the intervening 23 years but also the rapid development of a wide range of carotenoids. Details of the fundamental research and the chemistry involved are to be found in publications by Isler and his colleagues. Fig. 1. Relationship of carotenoids and vitamin A. 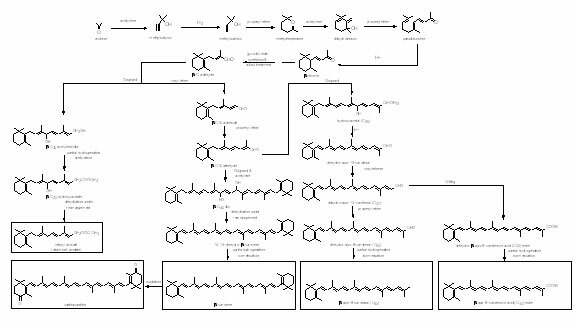 An outline of the complexity of the route to b-carotene, other carotenoids of commercial significance and vitamin A is given in Fig. 2. The scheme has been assembled from several sources and should not be taken as necessarily representing normal practice. The synthetic routes to many other carotenoids are known: some of these undoubtedly will be of interest potentially as food colours. However, such is the general climate of opinion, these days, that only those which have identity with carotenoids forming a part of the normal human diet will be likely to enter commercial development. In general, it is a characteristic of carotenoids that they are insoluble in aqueous media, have a low solubility in oils and a very slow rate of dissolution. The more pure the carotenoid compound is, the more limited its solubility. When in the pure, crystalline state, the carotenoids are very sensitive to oxidation. It is necessary for them to be kept under vacuum or inert gas. The oxidation is accelerated by light and, where oils are present. by metallic catalysts, especially copper, iron and manganese. Exposure to fatty acid hydroperoxides can initiate radical decomposition. In the right circumstances the hydroperoxides can directly attack carotenoids. As may be expected, enzymic reactions involved in the decay of vegetable matter may also cause the destruction of carotenoids. Through secondary reactions, the carotenoids are destroyed by gamma radiation. The sensitivity of carotenoids to oxidation makes the use of antioxidants desirable. In this connection the value of vitamin C and its derivatives and tocopherol is considerable and not least because of their widespread acceptance. 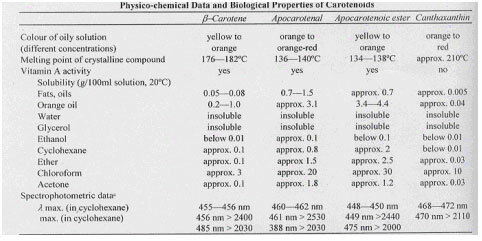 The more important physical properties of three pure synthesized carotenoids are given in Table 3. It must be remembered that the carotenoids are not normally available in the pure forms. Stability and difficulty of application preclude this although for the research worker, samples can usually be obtained from the manufacturer. Many publications also list properties for a fourth commercial carotenoid-b-apo-8'-carotenoic acid (C30) ethyl ester. The information is included in this review although the use of this carotenoid, at least in Europe, is not large in direct food addition terms. It is one of the substances acceptable for marking intervention butter oil within the EEC. The level recommended, however, makes the colour level a little too high for applications where colour level is required to be low; shortbread being a good example. Fig. 2. Some synthetic routes to carotenoids and vitamin A.
a The carotenoids isomerise in solution during storage or on heating; the predominant isomer in the equilibrium mixture is the trans compound. The values given correspond to the trans isomer. It will be clear from the foregoing that in the pure state synthetic carotenoids do not have properties, which favour their direct use as food colour. A very large technology has grown up which involves the preparation of application forms which not only improve stability but also allow their use in many kinds of food products. Naturally, much of this application technology is of a commercially sensitive nature. A very useful summary was given by Klaui et al. of the methods used which, while mainly for fat-soluble vitamins, are also applicable to carotenoids. In general terms, there are two main fields of application for any food colour: those involving aqueous systems and those which are essentially non-aqueous. The former predominate. Thus, commercial products tend to follow these two lines. For convenience, the same division will be adopted here, although the fat-soluble products will be considered first. Carotenoids are particularly potent colours. At the levels at which, for example, b-carotene is added to fat-based foods, solubility is not a major problem. The very slow dissolution rate of the crystalline substance is a disadvantage. The simple expedient of reducing the crystal particle size will overcome this problem but clearly, due to its consequently greatly increased exposure to oxygen, it will be less stable. The particles of about 2-5 Âµm size are produced in practice by grinding in an attritor-type mill under a nitrogen atmosphere while suspended in an edible oil. The end product is normally packed under oil and nitrogen which retard the oxidation enough to enable the product to be distributed, stored and used with very few problems. Of the four commercially available carotenoids, b-carotene and apocarotenal are distributed in suitable application forms for fat-based foods. The remaining two, apocarotenoic ester and canthaxanthin, are not normally sold for such applications. This is primarily because of the duplication of colour shade. Micronised crystals of b-carotene and apocarotenal are available as 20% suspensions in an edible vegetable oil. In addition, b-carotene is available as a 30% suspension for large-scale application where the more difficult handling characteristics are not a disadvantage. When the dairy cow is on a good summer pasture she produces cream of a rich yellow colour which, in turn, gives a deep yellow butter. The colour is due primarily to b-carotene which has escaped conversion to vitamin A. In the winter, however, when, in some countries, the cow is on grain and dry roughage, the cream and corresponding butter are very pale. 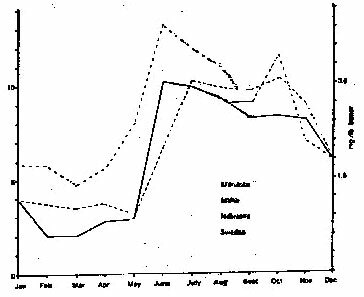 Seasonal variation in butter carotenoids is shown in Fig. 3. It is possible, at least in theory, to increase the colour of the cream and butter during these winter months by feeding a high level of stabilised b-carotene in concentrated form. In practice, however, the levels required in the animal's feed are so high to achieve a measurable result that the idea must be ruled out on economic grounds. It is easier, cheaper and more controllable to make the addition to the butter. In the first year of its commercial introduction, now a quarter of a century ago, successful industrial trials of b-carotene for colouring butter and margarine took place. While the standardisation of butter colour is relatively easy it is not always necessary. It is effective to add a solution of b-carotene in suitable oil to the churning mass. Provided that the microcrystals are fully predissolved, the butter will be suitably tinted. Any undissolved crystals will lead, over a period of storage, to small intensely coloured spots in the butter. This is caused by the slow dissolution and diffusion of the colour in the cold fat. Fig. 3. Variation of Carotene in Butter. As a colour, b-carotene has become the accepted standard for margarine in many countries. The application is still one of the more important in commercial terms. In a considerable number of countries vitamin A is added to margarine. In Denmark, a part of the activity of this vitamin is in b-carotene. In the UK the use of b-carotene is allowed and its activity, as vitamin A, may be taken into account when assessing the vitamin A level to ensure conformity with the statutory compositional requirements. The stability of the b-carotene in this application is excellent. The correct colour for margarine is achieved using only some 3 to 6 g pure b-carotene per tonne of product. In some markets, the consumers may prefer even more. It is only necessary to add the calculated quantity of the microcrystal suspension to the warm oil (usually at about 40-55 Â°C) and stir thoroughly. In practice, it is usual to use a proprietary mixture of the b-carotene with vitamin A, vitamin D, vitamin E and other trace ingredients. Such a mixture has obvious advantages in process and process control simplification. Such mixtures are based on a suspension rather than a solution of b-carotene. While it is possible to prepare relatively concentrated solutions, these have a short storage life. This is not a reflection on the stability of b-carotene. Over a period far too short to enable concentrated solutions to be of any practical value, the b-carotene recrystallises. When this happens the crystals will be much larger and their rate of redissolving will be correspondingly very much lower. The advantages of the microcrystals in rapid dissolution are obviously lost. Apocarotenal is sometimes used in margarine colouring either alone or in combination with b-carotene. The resultant colour level may be much more intense and so suitable for specialised markets. Alternatively, the combination may show an economic advantage even though the vitamin A value is lower. 'Margarines' with higher water content which have been whipped may need more colour due to the physical effect of lightening. The addition of colour to other food fats and oils beyond the butter and margarine markets is often practised. While free from the compositional requirements of margarine such shortenings can be used for catering and industrial manufacture of cakes, pastry and biscuits. Again, b-carotene provides an excellent colour for the purpose. By adjusting the concentration involved, the effects of variations in the colour of the egg yolk supply can be countered through the addition of carotenoids to the fat. Some liquid vegetable oils used domestically for frying etc., are often coloured naturally. Others may be devoid of colour and consequently not appear so attractive at the point of sale. The colour may easily be standardised by the use of b-carotene. b-Carotene and apocarotenal are used, especially in the USA, for colouring processed or process cheese. Apocarotenal is particularly useful for achieving the darker orange colour which is so characteristic of many products in this group. The colour or colours may simply be added to the hot melted cheese directly. Provided that the mixing is adequate, this method is acceptable. Any risk of possible uneven distribution may easily be avoided by predissolving the carotenoid suspensions in some of the melted cheese or in butter oil. In general, the micronised crystal suspensions of the carotenoids have a commercial advantage over the types developed for non-aqueous applications. This is understandable when the very much greater processing and other ingredients are taken into account. Thus, there is an incentive to try to colour foods with an oil component through the use of the oil-soluble colours. A great deal will depend on the nature of the product and the stability of the oil. For example, by colouring the oil the appearance of French fried potato and potato crisps (chips) may be considerably improved. Such an application is clearly not easy in view of the high temperature of the frying bath and the very easy availability of oxygen. As a result it is not practised in countries where high levels of antioxidants are not allowed. It has been suggested that this process could be extended to such items as fish, meat and poultry products coated with breadcrumbs. Usually, however, this is better achieved, particularly where the retail market is involved, by adding the colour in a suitable form to the bread from which the crumbs are prepared. Colour may be added to popcorn either by using coloured fat for heat transfer or by spraying a coloured oil after the corn has popped. In the latter method the shelf-life will be short and so oxidation is not such a problem. For the candied variety, of course, the colour is incorporated into the boiled sugar mass and a water-dispersible type is used. Canning and freezing vegetables in butter sauce can represent a problem when water-soluble dyes are used to enhance the sauce colour. Often, the colour migrates on storage to the vegetable tissue to the detriment of the appearance of the product. The carotenoids, being oil soluble, do not exhibit this effect. Through the addition of a small amount of b-carotene to the oil phase the appearance of imitation creams can be considerably improved. The amount of colour added is usually just enough to take away the otherwise unappetising whiteness of these products. Apocarotenal and b-carotene may be successfully used for colouring French dressings. The stability using a 0.5% solution of apocarotenal in oil was good when stored in glass bottles. Prolonged exposure to sunlight must, however, be avoided. Finberg reported the results of an important study based on comparisons made in seven companies between paprika, paprika oleoresin and apocarotenal. The improved colour uniformity and the stability of apocarotenal were judged to be of major value for dressings, especially when packed in plastic containers. In most of the applications so far discussed, there has been a stage where sufficient heat and agitation have been involved to ensure the complete dissolution of the added microcrystalline carotenoid suspensions. When processing frozen raw egg yolks, however, it is usually advisable to ensure adequate premixing of the carotenoid into a portion of the liquid yolk. Where high capacity, multiple plate heat exchangers are used at a temperature of about 60Â°C, there is usually enough heat and agitation to ensure solution. Some of the special forms of b-carotene developed primarily for aqueous-based foods are even more suitable both for this application and also for spray dried egg yolk. Pasta products made in the normal way from durum wheat have a characteristically rich, light yellow colour. The natural carotenoid content of wheat is responsible for this shade. However, when soft wheat is used, the naturally lower carotenoid content produces correspondingly pale pasta products. One method of overcoming this problem is through the use of specially coloured flour or starch premix. This idea first described by Schuchard in 1954 may also be extended to dry cake mixes and other similar products. A coloured flour premix may also be prepared using the method of spraying an oil solution of b-carotene into the agitated carrier. A level of 200 mg/lb (440mg/kg) has been reported by this method. The oil-soluble forms of carotenoids have also been used in various ways for colouring soft drinks. Rather than divide the topic, consideration of all forms will be given under the aqueous food heading. Devising application methods for oily foods where the carotenoids have some, albeit not often high, solubility was a challenge. In this area, where the solubility in water is virtually zero, new techniques have had to be devised and, indeed, are still being developed. Nature does not restrict the occurrence of carotenoids to lipid systems. Large amounts of carotenoids occur in the form of very fine dispersions and as such are capable of colouring aqueous media. Common examples of this are to be seen in the carotenoid colouring of the juices of the tomato, orange and carrot. The well-recognised stability may be due to the carotenoids being present in the form of complexes with proteins or lipoproteins. The submicroscopic structure may also be a factor in their outstanding stability. Methods of application of carotenoids to aqueous systems include the formation of emulsions, colloidal suspensions and dispersions in suitable colloids, particularly when a surface active agent is present. Dissolving the carotenoid in a suitable water-miscible solvent, such as alcohol or acetone, pouring the solution into water and then evaporating the solvent gives a colloidal suspension. Emulsions are generally useful but limited due to the low solubility of the carotenoid in oil which, of necessity, results in low potencies. Applying heat e.g. above 100Â°C, will enable the concentration to be raised but great care has to be exercised to ensure that more than the minimum isomerisation does not occur. Alternatively, other solvents can be used but a number of those which have advantages in this direction have obtrusive odours. The use of a surface-active agent results in very fine dispersions. The emulsions obtained are quite stable. The carotenoid can be further stabilised by the addition of ascorbic acid. By the process most widely used for commercial carotenoids and for vitamin A, the products are obtained as free-flowing powders. These are, in fact, reversible dried emulsions.The carotenoid is dissolved in a suitable oil using various techniques as outlined above. If necessary, suitable oil-soluble antioxidants may be added-in order to preserve the wide regulatory acceptance of the colour the antioxidants will usually be ascorbyl palmitate-and tocopherol. The aqueous phase comprises a solution of a film-forming, hydrophilic colloid such as gelatin with a plasticiser or humectant, e.g. sugar. Water-soluble antioxidants (ascorbates) and other substances may be added in this phase. The two phases are emulsified and then homogenised in a high-speed homogeniser until the average diameter of the oil droplets is below about five microns. Such a particle size helps to ensure a good physical strength of the colloidal matrix when dried as well as a good emulsion quality when reconstituted. After homogenisation, the emulsion is subdivided into small droplets, usually by spraying. It is necessary, after spraying, to keep the droplets separated from each other in order to prevent them sticking together. This is usually achieved by using a suitable powder or liquid medium to catch the particles. Powders will adhere to the surfaces of the particles and liquids will form a film around them. Both media, but especially the powder, will contribute a dehydrating effect. After separation from the catch medium, the particles are dehydrated and so form the characteristic very hard beadlets. These beadlets commonly contain 10 % of the carotenoid. These beadlets, provided they are kept dry have a very good stability and, although rather more clumsy to handle compared with most of the artificial dyes, are nevertheless capable of use in very many foods. Although in practice the method may be varied, it is normally suggested that the beadlets are wetted with 10 to 15 times their weight of water at about 50Â°C and stirred until completely dissolves. For experimental work or trials in processing, filtering through a very fine sieve is suggested in order to ensure no undissolved particles remain. Because of the physical properties of the particles of coloured material resulting in a dispersion of these beadlets, the colour of the emulsion will be darker in shade than would be expected in a true solution. Using the idea of a much more dilute emulsion with more readily soluble base colloids can permit the preparation of cold -water-dispersible powders. Such powders are different from the beadlets by being much less concentrated, about 1 % compared with 10% for beadlets, and by being lighter, not only in intensity but also in shade. In aqueous systems a great deal, will depend upon the product involved and the colour shade desired. Generally, however, it may be said that shades from light yellow through to tomato red are possible with the commercially available synthetic carotenoids. The following applications are mainly drawn from the application studies of the Roche organisation. Many have not previously been published. It is necessary to sound a word of caution, however, regarding the application of carotenoids to food products. The basic physical and chemical properties of carotenoid are vastly different from those of the artificial dyes. Similarly, the need, as described earlier, for supporting and protecting colloids makes for even greater differences. It would hardly be reasonable, therefore, to expect a weight for weight substitution of carotenoid preparation for artificial food dye to be possible. It is not. A certain amount of common sense has to be brought to bear. Nevertheless, many excellent results have been achieved already and, as the restrictions of legislation become more difficult still, more of the presently laboratory results will be transferred to production practice. In the normal process, the sweet mass, consisting principally of sugar, glucose and water, is boiled to the correct point and deposited on to an oiled slab. Flavour, colour and acids are mixed into the hot mass by kneading. When adequately mixed and when the correct temperature is reached, the mass is pressed into shapes and wrapped. At levels from 1.5 mg/kg to 20 mg/kg of pure substance, the carotenoids give truly beautiful colours. The cold-water-soluble b-carotene gives pale, slightly yellow sweets at the l.5 mg/kg level. At 15 mg/ kg, the colour is a strong but distinctly lemon yellow. Where the gelatin-based beadlets are involved, however, the colours of the sweets have a distinct red component. Apocarotenal and canthaxanthin can be used to take the colours forward through a more reddish orange to an intense orange red rather like a rich tomato shade. By using an appropriate grade of chlorophyll with the canthaxanthin, very attractive shades of brown can be achieved. On the other hand, using a low level when added to b-carotene, one can obtain an even more lemon yellow. Provided that certain obvious incompatibilities can be avoided, such mixtures are capable of reproducing a great many of the attractive shades previously considered impossible without recourse to the artificial dyes. The advent of the new continuous depositing technique for the production of high quality hard candy (e.g. the continuous depositor made by Baker Perkins) puts a higher demand on the colour and on the flavour as well as other ingredients. By this method the liquid mass is cast in moulds. It is necessary for colours and other additions to be made when the temperature is as high as 140Â°C some 50Â°C higher than in the more conventional process. Experiments on a laboratory scale have shown that the carotenoids are capable of withstanding the heavy demands of this process. In the slab technique, the resulting sweets are rarely transparent. The cloudiness which may result from the use of some carotenoid preparations is therefore no disadvantage. The continuous depositing method, however, produces candy in very smooth and clear pieces. The slight turbidity caused by the carotenoids may represent a slight drawback. A typical fruit jelly will contain sugar, glucose, sorbitol and agar-agar. The general principle of adding the sensitive ingredients after most of the heating has finished is employed here. The colour solutions and the flavours are added after boiling and before pouring and casting. The colours obtained with the carotenoids are similar to those produced in the hard candy. Slightly lower concentrations of carotenoids give excellent results. The cold-water-soluble preparation of b-carotene gives yellows ranging from pale at 1.5 mg/kg up to an intense yellow at 10mg/kg. As before, a red element is introduced by the gelatin beadlet product resulting in a definite orange. Apocarotenal and canthaxanthin in the beadlet form can produce interesting and useful shades of reddish orange through to orange-red. As a general guide, a concentration of 10 mg/kg for the carotenoids in this application gives a reasonable range of product colours. Pectin jellies made to a conventional recipe and coloured with b-carotene and canthaxanthin as well as other natural colours show excellent stability over six months stored in daylight and darkness. A form of chlorophyll used to shade some samples was tested on its own. It showed a little loss of brightness and, towards the end of this exacting test, a shift of shade towards yellow-brown. Marzipan products may be coloured either on the surface only or throughout the mass. Alternatively, of course, both techniques could be used. After the marzipan has cooled down to about 50Â°C the surface may be painted with predissolved carotenoids. Towards the end of the mixing when the mass has cooled, some powdered sugar is added. This improves adhesion of the colour preparation. Usually, the solution strength used is in the region of 0.1 to l.0%. The surface often dried and may be given a coat of protective varnish. Once again shades from yellow through to red are obtained with the three carotenoids using the different types available. Mixtures of canthaxanthin with a suitable type of chlorophyll enable rich brown shades to be obtained. To colour the mass of the marzipan, the colour solutions are added with the powdered sugar when the product has cooled to about 50Â°C. The commercial carotenoid forms used at levels to give between 3 and 10 mg/kg pure substance give attractive shades from pure yellow through to orange. The water-soluble or dispersible forms of the carotenoids may be used to obtain especially attractive colours for sugar-coated sweets. These products include the chocolate beans, chewing gum, nuts and so on which are coated by a process essentially the same as that used for sugar-coated pharmaceutical tablets. The standards of finish may not be the same in the two industries but the successful application of the carotenoids and other natural colours is a point in common. Before application to the tablet with a white sub-coating, the carotenoid preparation will have been dispersed in water in the ratio of 1:4. At about 20% this is double the concentration usually recommended for aqueous applications. While not so easy to achieve, the higher concentration is necessary to avoid over-dilution of the syrup. The concentrate is then mixed with hot sugar syrup containing 100 parts sugar in 40 parts of water at 106Â°C. The coloured syrup is then applied to the sub-coated tablets by the conventional technique. The number and thickness of the layers will be determined by the quality standard required and, of course, the economic demands of time and material in process. At the pharmaceutical end of the scale, some 60 or more coats will produce a very high quality tablet while at the confectionery and an adequate result can be obtained with, say, six to eight coats. The colour range includes shades betweet yellow and red according to whether b-carotene, apocarotenal or canthaxanthin is used. The addition of a suitable grade of chlorophyll enables interesting variations to be made. By this means, not only can attractive brown shades be made but also the reddish overtones of b-carotene may be toned down to create more yellow results. Using newly developed application forms, canthaxanthin in particular can be applied to produce especially attractive shades ranging from pale peach through to a strong, almost purple shade. The stability of these colours in this application is excellent. With some tablets, only the slightest change is noticeable after some 15 years or so. It is not so easy to give concentrations in this application. Using a tablet core of 9 mm diameter, the amount of colour expressed as pure substance per tablet will mainly lie in the range of 5 to 50 Âµg depending on the shade and the application type used. Having made fondant in the usual way, the colour is added in the predissolved form while the mass is still warm and reasonably fluid. When the distribution is complete, the fondant is deposited into starch moulds, allowed to set and finally wet crystallised. An attractive range of pastel shades is possible with the water-dispersible carotenoids. Concentrations of 3 to 50mg/kg will cover most of the colour range desired. Shading with other natural colours, especially chlorophyll, will increase the range. While, strictly, it should be included under the oil-soluble applications heading, 'white' chocolate seems more logically placed under confectionery. The carotenoids can be used to give pleasant pastel shades to this confection. Some trials have given results with rapid colour loss on storage while others have been remarkably stable. No direct evidence is available to allow this conflict to be explained. However, there can be little doubt that the responsible factor is oxidation of the carotenoid. In the successful trials, the fat used was a hard type intended for export to very warm climates. It was also fresh and the product processed on a small scale whereas the unsuccessful trials involved a cheap commercial product where formulation and other details were not known. The carotenoids, b-carotene, apocarotenal and canthaxanthin may be used simply to give very attractive shades from vanilla yellow through to a reddish orange. By careful shading with other natural colours, a very useful range of colours for ice-cream can be made. The coffee and chocolate browns, for example, are particularly good. Concentrations, depending on the end result desired and the colour involved will be mainly in the range 10 to 30mg/kg. The stability is excellent. In the products known as sorbet ices (or, if frozen without agitation and, usually, on a stick, lollies) the shades of vanilla yellow through to a red can be obtained using lower concentrations. In this case 3 to 10mg/kg will probably suffice. Sherbet ices fall in between these groups of frozen products. The presence of some fat and milk solids may be expected to raise the colour concentration. This is so but, depending of course on the amounts of these ingredients, the levels will be nearer to the plain water ice than to ice-cream. For the trials which were carried out on yogurt, 1 to 2% of skim milk powder was added to whole milk. The end product contained 3.5 % fat. The milk was incubated in large tanks at 42-45ÂºC. After the fermentation was complete, sugar, flavour and colour were added with stirring. Quite low concentrations, 2 to 8mg/kg of the carotenoids in water-dispersible forms, were adequate to produce an attractive range of colours from lemon yellow through apricot and peach to redder tints. It may be expected that b-carotene might lend itself-ideally to achieving a suitable colour in hard cheeses such as Cheddar, Red Leicester and Double Gloucester. As a result of success at the bench level with various experimental application forms of b-carotene, a trial was set up at a pilot level. The results were highly encouraging in that the distribution of the colour was strongly towards the curd rather than the whey. From this viewpoint, the concept may prove useful commercially because of the increased value of whey when it has a lower colour level. Losses proved to be very small and stability during the normal shelf-life of the cheese was excellent. While the results for Cheddar cheese were generally considered to be first-rate, the particular shade of yellow did not lend itself to being used at higher concentrations. When increased to the level usual in say, a Scottish cheddar, the yellow was rather too low in red component for the cheese to have been accepted. Further trials using mixtures of the carotenoids are expected to bring the colour nearer to the ideal and at the same time to reduce the cost in use in the darker cheeses. The natural presence of b-carotene in many of the ingredients used in baking makes its addition, when necessary, an advantage. It provides a convenient and practical way of giving a rich golden colour to cakes and other baked food. Quite low levels, in the region of 4 to 12 mg/kg are usually quite enough to achieve an excellent end result. When the product contains fat or shortening, the colour could be added by using the fat-soluble form and predissolving it in the fat. Alternatively, and usually preferably, the b-carotene is used in water-dispersible form. The beadlets are predissolved in water and added with the other liquids. Some colour loss may occur during long baking times and also when the temperature is unusually high. Should this occur, the effect may be compensated for by adding a suitable overage. Usually, 10-15 % is enough, In the finished product in normal commercial packings, the stability of the colour is good. If the product is exposed to sunlight for extended periods, some surface fading may occur. In normal handling, fading is not a problem. Interesting results in brown biscuit shells have been obtained using canthaxanthin in the presence of caramel. Shade variations and dulling can be made with a grapeskin anthocyanin and a carbon black of vegetable origin. Canthaxanthin and b-carotene have been used as colours for wafer biscuits. After predissolving in water, the colours were added to the separately prepared batter and thoroughly mixed. The wafer was cooked for 90s: the plate temperatures were 220Âº C lower and 200Âº C upper. The b-carotene results were very successful not only in shade but also in evenness of coloration across the sheets. Canthaxanthin showed a slight change of colour towards the yellow end of the spectrum. This was probably due to its being extracted into the fat used in the recipe. A particularly satisfactory chocolate-coloured wafer was made with a blend of canthaxanthin and caramel. The carotenoids also provide a particularly attractive range of colours for breadcrumbs. Coloured breadcrumbs are an important article of commerce in these days when so many breaded products are distributed through the frozen food chain. Such items include the ubiquitous fish fingers as well as many other meat and fish preparations. Crumbs coloured in this way stand up to the preheating, freezing and subsequent cooking very well. The stability of b-carotene in cake mixes is good. In products of this type, the conventional gelatin-based beadlets are not normally used. This is because there is a wide discrepancy between the particle sizes of the colour and the mass of the mixture. While there may be a problem of separation in handling dry mixtures, the presence of fat would be expected to prevent this. Greater problems are represented by the inevitable presence of visible dark spots in the mixture. Consumer reaction is likely. Similarly, due to the relatively slow rate of dissolving, particularly when the batter is prepared cold, the colour will progress through local spots and streaks to an even result. These intermediate stages are not likely to create confidence on the part of the housewife. It is therefore necessary to employ the rapid dissolving type with finer particle size. The benefits of this type are increased in this application by the lower concentration. Many cakes and biscuits are decorated or filled. Strictly, these decorative items are not baked but they fit here with their associated bases. The cream filling of a biscuit sandwich is usually made up of fat of suitable plasticity and sugar. Skimmed milk powder may also be added. The colour, in the form of strong solutions of the water-dispersible types may be added after the mix is otherwise complete. The small amount of water involved does not affect the product adversely. It is essential. however, to continue mixing long enough to ensure an adequate distribution of the colour. If this is not done and the cream cools too much, the result may be rather streaky. Many biscuits containing cream fillings are packed for distribution in transparent wrappings. In order to show the intending purchaser the true nature and high quality of the product, manufacturers not only use such wrappings but also pack the biscuits end on. The practice not only exposes the cream to the consumer but also to the demanding lighting conditions of the modern supermarket. As a result, the carotenoid creams tend to fade. At the same time there may be demonstrable changes in the fat component. The use of a suitable protective agent such as sodium ascorbate, tocopherol or ascorbyl palmitate with tocopherol can do a great deal not only to delay the colour change but also to prolong the shelf-life of the biscuit cream. Where the artificial dyes are used in biscuit creams, the oxidation of the fat still takes place. There is, however, no colour change observed. Some biscuits are filled with a jam-like preparation. Canthaxanthin and apocarotenal may be used to colour this jam depending on the shade needed. The stability is improved by the addition of ascorbic acid to a point where the biscuit shell is likely to fade first. Fondant-type icing used on cakes for distribution to the retail trade can be coloured successfully with carotenoids. The addition of b-carotene gives a pleasant warm yellow which may be made more 'lemon' in character by adding a little of a suitable chlorophyll type. Canthaxanthin used with vegetable carbon black gives a very useful chocolate-brown shade. The icings used on biscuits, while of a harder consistency and subject to a longer shelf-life, may also be successfully coloured with carotenoids. In some cases, where gelatin is a component of the icing, the gelatin in the protective matrix of the carotenoid may have to be taken into account otherwise changes of consistency may result. Bearing in mind the importance of carotenoids in the make up of the natural colour of oranges it is not unexpected that the synthesised carotenoids should have found application in orange juice from an early date. During the course of a season variations in colour of juice occur. Differences of colour occur also due to the varieties grown and the place where they are grown. Producers and, perhaps, more especially distributors like to decrease the variation in product colour at the point of sale. There can be little doubt that the purchaser is considerably influenced by colour. The influence is obvious when the product is offered in a transparent pack. While presentation in cans may seem to change this, the product is subject to the same scrutiny when poured out. It is, therefore, by no means an uncommon practice for juices to be standardised in colour before packing whether the pack is to be glass or tin plate. Fruit juices, and particularly orange, are generally accepted as valuable items of the diet. The addition of b-carotene is in no way inconsistent with this. Its presence enhances the nutritive value of the juice, the addition of a suitable quantity of ascorbic acid not only improves the stability of the carotenoid but aslo, of course, enhances still further the nutritional value. There are many published reports of the addition of b-carotene to orange and other fruit drinks. Nearly twenty years ago the stability of b-carotene was demonstrated. In glass packs and in various types of tin-plated and enamelled cans the stability was good. In glass, the products were stored for three weeks at 104ÂºF and for three months at 86ÂºF. In the former group only one sample fell below 90 % retention while in the latter, only two were below 90 % retention. The averages for the whole trial were 96 % and 95 % retention respectively. In the experiment with cans, the retention was better. There was some scatter of analytical results but the averages for retention over six and twelve months at 75ÂºF were very close to 100%. Although canthaxanthin may not have a ready identification with the natural colour of the tomato (mainly lycopene) its colour is remarkably close. For this reason, canthaxanthin enjoys wide use for the standardisation and enhancement of the colour of tomato juices. Clearly in such applications, the suspectibility of b-carotene to oxygen has to be remembered. Three points particularly should be remembered when processing fruit juices. Firstly, deaeration by mechanical means, secondly, reduction of headspace to the lowest amount practicable and thirdly, the use of ascorbic acid which is particularly effective. The incorporation of carotenoids in soft-drink powders represents no particular difficulty. It will be important, naturally, to ensure that an appropriate commercial type is used. The conventional beadlet has a large particle size of intense colour. Consequently, the end product will be uncoloured and have dark spots which will dissolve only slowly in cold water. Some of the more recent types with good cold water solubility and fine yellow particles are much more suited. The carotenoid could be dissolved in a suitable small amount of water and sprayed on the sugar crystals in a trough mixer.The effect of the small addition of water on the sugar flowability could be negated by adding a little tri-calcium phosphate, followed by the other ingredients. It would be necessary to conduct suitable trials in order to ensure that the colour stability was good. A number of techniques are available for the successful incorporation of carotenoids into soft drinks. These involve the application of different ways of overcoming the basic difficulty that of the insolubility of carotenoids in water. The first method involves using the essential oil in citrus drinks as a solvent. The 20% suspensions of micronised carotenoids (the usual oil-soluble application forms) can be used to colour the flavouring oil prior to emulsification. The low solubility of the carotenoids in essential oils, Table 4. and the heat sensitivity of these oils presents a difficult problem. The apocarotenoids have a significantly higher solubility in these oils and this allows their inclusion in tinctorially useful amounts. The solubilities mentioned in Table 4 have been determined in orange and lemon oils without heating. Canthaxanthin and b-carotene are obviously unsuitable for addition via the essential oil because the amounts which can be incorporated are far too low. However, their use in conjunction with the two apocarotenoids will enable suitable variations in colour shade to be obtained in the pale yellow to dark orange range. In the second method, the water-dispersible forms of carotenoids are used. This is indeed, a most important application in commercial terms. The water-dispersible beadlets, predissolved, may be used at various levels, alone or in combination with one another or other natural colours to obtain most, if not all shades required in this area of the food industry. As a very approximate guide, carotenoid additions for an orange drink will be in the range of 1 to 5g per 1000 litres. Particularly, it is strongly recommended that the colour solution added should be homogenised with the pulp, the fruit concentrate or a mixture of the concentrate, sugar syrup and citric acid before dilution to the bulk beverage. Not only does this homogenising step greatly enhance the appearance by producing particularly brilliant results, it can also contribute to a reduction in the amount of added colour needed to obtain a given colour intensity. Through the action of the homogeniser which encourages the carotenoid to 'stick' to the fruit particles, the stability is very much improved. The presence of the fruit pulp in beverages of this type is also advantageous for stability reasons. Many 'lemonades' and similar beverages containing no fruit concentrate (or only very small amounts) when coloured with b-carotene will bleach in sunlight in a relatively short time. Klaui and Manz described some experiments set up to demonstrate the excellent stability of carotenoids in soft-drink products. They prepared, under production conditions, a drink containing 1.2% orange concentrate, 35 mg/litre ascorbic acid, 0.2% citric acid and sugar to make a syrup. The syrup was coloured with b-carotene and canthaxanthin at a level sufficient to ensure that, after dilution and processing, each one-litre bottle contained 1 mg each of the two colours. The coloured syrup was intimately homogenised with a pressure homogeniser, pasteurised at 60Âº C for 30 min. and deaerated. The apparatus, pipework and so on was of stainless steel. Coloured syrup in the bottles was diluted with cold, carbonated water, stoppered and inverted several times to ensure adequate mixing. Reference samples were prepared in the same way with the same raw materials but coloured with tartrazine and sunset yellow. The results of an exposure test to direct sunlight and diffuse daylight are shown in Fig. 4. Although the results of this test were only reported after six months' storage, the test continued for several years. The reported results were stilll valid after that extended period. The conditions of this test were rather extreme as it would hardly be normal for beverages to be exposed to direct sunlight for half a year. The rate of loss of the artificial dyes, however, is very well within the normal shelf-life of such products. The loss is very rapid, even where no ascorbic acid is added. The fruit pulp or concentrate will invariably contain some vitamin C, usually quite enough to cause decoloration. In canned beverages, the effect of sunlight is absent, apart of course from temperature rise if the cans should be left exposed to the sun. Canned products containing azo dyes and ascorbic acid may be subject to another problem due to the causative effect of azo dyes on can corrosion. Sunset Yellows FCF is particularly bad in this respect. b-Carotene, on the other hand, is much less corrosive. Sulphur dioxide is often used as a preservative in some squashes and concentrates. The carotenoids are stable to levels between 50 and l00 mg/kg of SO2. Using the carotenoids in the gelatin protected beadlet form has the advantage that being in effect dried reversible emulsions, they impart a certain cloudiness to the product. It is often enough at least to allow a worthwhile reduction on in added clouding agent, if not its exclusion. Sometimes, over a period of storage, a colour change may occur. Usually, with b-carotene which has been added in the gelatin protected form the change is from the normal orange-yellow towards the more pure yellow. The change is not usually great and may be shown to be due to the solubilising effect of oils in the formulation, e.g. the orange oil of the orange flavour base. The rather pale, slightly greenish tint of 'bitter lemon' can be achieved, as may be expected by using b-carotene with a small addition of chlorophyll. With some added ascorbic acid, the stability is particularly good. New water-dispersible powders which give optically clear results in beverages were described by Emodi et al. Based on a gelatin-carbohydrate matrix, the powders were reported to disperse easily in hot and cold water and to distribute very readily in other solids such as sugar 'plating'. These spray dried, 'micro-colloidal dispersions' give haze-free optically clear aqueous preparations in the colour range yellow to cherry red. The third application method makes use of the increased solubility of carotenoids in suitable vegetable oils on heating. The necessary amount of b-carotene is dissolved in a vegetable oil (such as groundnut oil) by heating strongly for a few minutes ideally under nitrogen. When the carotenoid has fully dissolved there will be a visible change of appearance. In the suspension state the b-carotene will be an opaque brick-red colour but, when dissolved the solution is a clear dark red. It is especially important to avoid overheating to reduce the chance of oxidation and also of isomerisation. When large amounts of such a solution are to be made it is worth doing so in small lots or even resorting to a continuous flow process in order to reduce the risks of overheating. The concentrated oily solution is cooled a little but while still very hot is added to the orange concentrate together with the orange oil, if used. It is immediately followed by emulsification into aqueous gum acacia solution and then passed through a two stage high pressure homogeniser. The resulting base is then mixed with a suitable sugar syrup and diluted with cold carbonated water. The end products are especially attractive and, in spite of a low fruit content, very stable. Final concentrations in the region of 2 to l0 mg/kg of carotenoid are usually quite enough by this method. Obviously, this basic process is capable of modification when certain clouding agents are permitted. Brominated vegetable oil and abietates are relatively good solvents for carotenoids. The amount of vegetable oil introduced in this way is not large but will usually necessitate a slight adjustment of the specific gravity by increasing the proportions of the heavier ingredients. Another possibility for applying carotenoids to soft drinks was mentioned by Klaui quoting a Japanese patent. The process involves heating the carotenoid with hydrogenated castor oil and polyoxy-ethylene ether at 100-150ÂºC under nitrogen. Aqueous dilutions of such solutions are stable and transparent. As Klaui points out, while such solutions look quite appealing, such non-ionic emulsifiers are not permitted for inclusion in foods in most countries. There is, however, scope for the application of this idea in countries where the available permitted emulsifiers can be used effectively in the process. It can be argued that the use of an artificial emulsifier is hardly a suitable vehicle to promote the use of natural colours. This is, however a matter for the user and his local legislation rather than for the supplier to decide. The advantage of canthaxanthin in standardising and enhancing the colour of tomato juices has already been mentioned under the heading of fruit juices. It is perhaps obvious that this use extends into the processed tomato-based products industry. The now ubiquitous baked bean and its fellow, spaghetti (in whatever shape it manifests itself), may have their enrobing tomato sauce colour adjusted by the addition of canthaxanthin. Similarly, other products based on the tomato, including dehydrated tomato powder, are standardised with canthaxanthin. In some countries, the usage of canthaxanthin in rapid preparation soups is very considerable indeed. The practice does not seem to be very common in the UK however. The stability of canthaxanthin added to canned tomato soup is excellent. It was found that only about 10% loss had occurred after heat processing and storage for a year at room temperature, the canthaxanthin retention was still well above 90% of the initial value. During the work, variations in tomato content were examined and the conclusion reached that it would be possible to allow a reduction of perhaps as much as 40% of the tomato solids. The comment was also made that the canthaxanthin product was markedly superior in colour, after storage for 14 months at room temperature, to the high solids control. As long as tomato concentrates remain relatively very cheap, such a substitution is not likely to become widespread. Should the situation change, careful consideration will have to be given to the appropriate labelling regulations. Lycopene measurement is often taken as an indicator of tomato content. Canthaxanthin is structurally different from lycopene. Small additions of the appropriate carotenoid can improve the appearance of soups in both canned and packet forms simply by taking away the otherwise pale, unappetising colour. As a general rule the effect mentioned earlier under the fat solution applications is useful. This is where use is made of the inability of vegetable tissues to absorb the carotenoids from solutions. In the example quoted, b-carotene added to butter sauce did not migrate to the vegetables in the can. It has been reported, however, that a 'dispersible liquid concentrate' of canthaxanthin can be used to colour maraschino-type cherries. The colour was reported to be an attractive red similar to that obtained by current FD and C dyes. A slight bleeding of colour was observed when the cherries were placed in water. The normal methods of application do not exhibit this effect. Canthaxanthin has been used to produce a particularly attractive colour in canned frankfurter sausages. Canned cod roe is another application for canthaxanthin, so also are prawns and shrimps where by adjusting the conditions suitably the carotenoid will adhere to the surface. Some promising results were obtained by Billings in adding colour to Pacific pink salmon before canning. Unfortunately, the initially good results obtained on the bench were too slow for the production line. The effects of many ways of dipping and spraying contain encouraging elements which will, no doubt, lead eventually to success. The newer cold-water-soluble application forms are especially suited to the milk-based dessert powders. This is particularly so of those, such as instant puddings, which are prepared with cold milk. The simpler pregelatinised starch puddings are only whisked for a minute or two before being left to stand prior to eating. Speed of dissolving is therefore of primary importance. Some of the more recent products are based on various applications of the dried emulsion concept. These often take a little longer to prepare and the problem is not so acute. Pudding products where either hot milk is used or the mixture is heated do not usually cause difficulty. Canned dessert products, canned custard, rice and other puddings may be coloured or simply made slightly creamy in appearance with carotenoids. The fat-soluble colour can be incorporated by emulsification into the milk or alternatively the predissolved water-dispersible form can be added to the milk. Jellies based on gelatin are usually distributed in one of two forms. In the world at large the product is known as jelly crystals and consists simply of a dry mixture of the various ingredients. In the UK especially, this form is not so popular. The usual product is a jelly tablet-a highly concentrated block of the dissolved ingredients. Whichever form is involved, they have one principal characteristic in common: when made up, they must have virtually absolute clarity. The tablet product in particular, is often presented as containing fruit juice and indeed, the concept of both is fruity. Nevertheless turbidity is not appreciated. Through the use of the carotenoids, there is a small potential clouding. Bunnell and Borenstein tried to overcome the difficulty by mixing the carotenoids with azo dyes in jelly crystal. If the present legislative changes continue, the choice is not so much likely to be whether carotenoids can substitute for azo dyes but whether natural colours are better than no colour at all. Carotenoids may be used to colour jam-like products which are incorporated into yogurt-based desserts. Canthaxanthin is particularly interesting in this respect. The carotenoids are widely accepted as food colours. 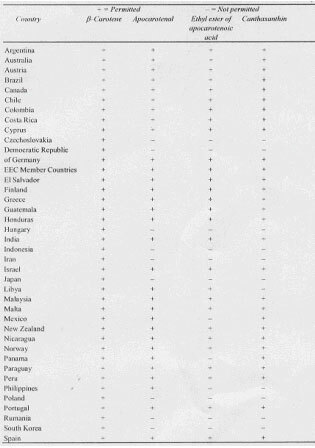 As a guide to the international status, the latest position is summarised in Table 5. The peculiarities of the regulations of any country compared with another are a subject more suited to another place, as is the matter of the individual regulations themselves. The table, therefore, is given as a guide. Some countries may only have omitted a carotenoid because its inclusion was not requested. Others may permit a carotenoid but not for certain applications. To say that the situation is confused and confusing is an understatement of considerable magnitude. For the food manufacturer hoping to export his product, it is necessary to establish the exact position for each individual colour which he may wish to use and also for the application. Colour manufacturers with world-wide organisations can often help in this direction: their local agencies and offices may be able to give interpretive advice not readily obtainable elsewhere. The carotenoids we eat are obtained from two sources: those made by the plants in our diet and those which were made in a chemical factory. The two types are identical chemically and physiologically. Has the carotenoid any pro-vitamin A activity? Can the digestive system extract the carotenoid from the plant tissue? Will the extracted carotenoid be absorbed? Is the body able to convert the absorbed carotenoid into vitamin A? It is not enough to have a positive answer to each question: there is also the extent to which each may apply to be considered. The situation is very complicated and well beyond the scope of this chapter. Nevertheless, some indication of the confusion and some guidance is given. Table 6 summarises some of the more common sources of reference on the equivalence of b-carotene to vitamin A. In most diets the major source of vitamin A activity is b-carotene. It is doubtful if any diets are exclusively retinol containing. The question, therefore, of the value of b-carotene in terms of retinol equivalent is very important. A succint account of various trials is given in the WHO report. The two problems were recognised-firstly, the ability of the animal to remove and absorb carotene from the food and secondly, the ability of the animal to convert the absorbed carotene to vitamin A. In the report it was concluded that, having emphasised the probable errors involved, only one-third of the ingested b-carotene was available and only half of it would be converted to vitamin A in the body. A conversion factor of six to one was recommended for humans (i.e. 6 Âµg b-carotene = 1 Âµg retinol). The other carotenoids were assumed to have only half of the activity of b-carotene. It is interesting to note the differentiation made in the Swiss regulations between the b-carotene dissolved in fats or oils and that present in vegetables or supplied without fat where, it is said, the absorption is usually very low (often below 10%). In such cases, it is recommended that only biological tests with animals can give an accurate answer. The UK regulations seem to suppoet this point. The Margarine Regulations, 1967, define vitamin A and include b-carotene on the basis that 0.75 Âµg shall be regarded as equivalent to 1 IU of vitamin A. (i.e.2.5 Âµg) b-carotene equals I mg retinol). The Labelling of Food Regulations, 1970 etc., however, allow b-carotene to be converted on the basis of 6 mg b-carotene equals 1 Âµg retinol. A collection of a large number of reported experimental results is given in Appendix 3 of the WHO report. Taking the values reported which were sufficiently firm to be used, the average is indeed very close to the one-third in the recommendation for availability. It is, however, interesting to note that the collected values include, for example cooked carrot where the average value is nearer to one-quarter. Similarly, taking only the various control experiments where an oil solution of carotene was used, a value nearer to two-thirds would be obtained. As the use of synthetic carotenoids increases, this may need to be taken into account in assesing the dietary intakes.